If you are one of the lucky ones, you only go as far as your garden to snip holly berries for your indoor holiday decorations. When the holidays are gone, those same berries, and the birds they attract, are decorating your outside world. They always were, but now we have more time to enjoy them! Our area is home to a wide variety of hollies, and their berries are at the top of the list of favorite foods for many birds. Birds have a high metabolism and need to eat frequently to maintain energy levels. Supplemental feeders will attract many resident birds, but not all birds come to feeders. Many summer insect-eating birds switch to berries when insects are in short supply. These birds are equipped to search out food sources, but why not plant holly berry bushes, so you can enjoy these birds in your yard while they feed? Many hollies are dioecious, meaning the male flowers provide pollen and female flowers, which later produce berries if pollinated. Male trees bear male flowers; female trees bear female flowers. The best pollinator for any holly is a male of the same species. The good news is one male plant can service about five to seven female trees. Also, if a male flower of one species overlaps with the flowering time of a female flower of another species, pollination can occur. In a few hollies, especially Chinese varieties of Ilex cornuta, the berries are not pollinated; rather, they are parthenocarpic, developing a sterile fruit. Have you every noticed that some years hollies are loaded with berries, but in other years there are only a few? There are several factors affecting this, beyond not having a suitable pollen source. Late Spring Frost: This can and often happens in our area, and no one is ever happy about it. When this occurs, many of the flowers drop, limiting the fruit set. Late Fertilization: If we have a long winter and short spring, fertilization is often delayed. If this is the case, there is very little energy put into blooming, resulting in fewer flowers and fewer berries. Summer Drought: When water is in short supply, the berries are the first to suffer. During a drought, check to see if any developing fruit is wrinkled. If so, water deeply, or they will likely fall from the bush. Biennial Cycling: While the holly berries add important color to the winter landscape, we want the birds to eat the fruit each year. If not eaten, the fruit remains, and little energy goes into blooming the following spring, plus there are fewer sites from which blooms can arise. The berries aren’t wasted, because the mocking birds will eat them in the summer, but then there is only an every other year bumper crop. Unsynchronized Bloom Periods: Various hollies have bloom periods covering several months; some species have completed this process before other species begin. This is why it’s important to have a male of the same species for each of the female species grown. Hollies prefer acidic, fertile, moist and well-drained soils, but they adapt to adverse conditions, including poorly drained soils. American holly, Ilex opaca, grows wild in open spaces, so male pollen may be near by. To insure fruit set, add the male pollinator, Ilex opaca ‘Jersey Knight’, a male pollinator for American holly. The English holly, Ilex aquifolium, male flowering time overlaps with the American holly, providing pollination. 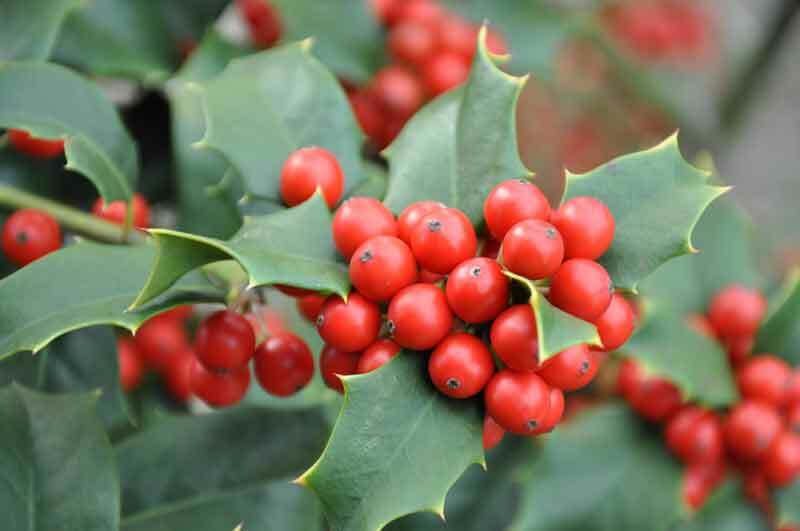 To fully insure berry production, plant the male English holly, Ilex aquifolium ‘Monvila’. Winterberry holly, Ilex verticillata, requires a male plant to bear noticeable numbers of fruit. ‘Apollo’, ‘Raritan Chief’, ‘Jim Dandy’, and ‘Southern Gentleman’ are companions to set fruit for the female. Foster holly, Ilex x attenuata ‘Fosteri’ and Savannah holly, Ilex x attenuata ‘Savannah’, typically get enough pollen from nearby American holly to set fruit; as does the Possumhaw holly, Ilex decidua. In the case of the Chinese hollies, many don’t require a pollinator to set fruit, since some are parthenocarpic, setting berries without a pollinator. The resulting fruit is sterile, such as ’Burford’ holly, Ilex cornuta ‘Burfordii’. Nellie R. Stevens, Ilex x ‘Nellie R. Stevens’, is partially parthenocarpic. Better fruit set occurs when pollinated by a close-at-hand Ilex x ‘Edward J. Stevens’. Yaupon holly, Ilex vomitoria seems to get enough pollen from unknown sources since they tend to berry and are not parthenocarpic. For more fruit production, ’Will Fleming’ is a male plant that helps set more fruit. If you didn’t get all you wished from the holiday season, treat yourself—and your bird-friends—by planting some hollies for you and the birds to enjoy at home. If you don’t have berries to feed the birds, you can turn to seeds. Click here for a quick guide to seed types.